This is the eighth in a series of one-on-one interviews with City Council candidates, speaking for and about themselves. Paul Merritt first lived in Laguna Beach in 1964. He graduated from Laguna Beach High School in 1959 and later earned a juris doctorate. Merritt moved to Laguna Niguel and was elected to the newly incorporated city’s council in 1989. He also served on Niguel’s Planning and Public Safety commission. 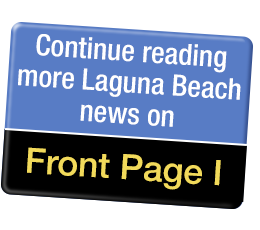 He is making his third run for a seat on the Laguna Beach City Council, one before he moved to Niguel and the second one in 2014. He ran for the U.S. Senate in 2016. “I offer my candidacy to serve on the City Council to preserve the heritage of our Village and increase the safety of our citizens and visitors,” he said in an interview with Stu News announcing his candidacy. A jovial Merritt enjoys the opportunity as a candidate in the 2018 campaign to share his concerns about the Laguna he loves and the fixes he proposes. “I think highly of the candidates, even the ones I oppose,” he said in an interview on Sunday. The City Council? Not so much. No way is the current City Council prepared or preparing for the future, he opined. “My first example: I believe we are five months away from food trucks on our streets,” said Merritt, referring to a state law due to go into effect January 1. Merritt also has a beef with Council for what he calls micro-managing businesses. His solution: “flexibility.” One rule fits all does not work in his opinion. Unlike other candidates running for the council, Merritt does not hold the City responsible for providing affordable housing for seniors or artists. “I see no reason that we have to jam affordable housing for artists in the canyon,” he said. “The council continues to pander to artists, but building high-rise affordable housing for them in the canyon is bad for Laguna. Speeding on Coast Highway is another of Merritt’s pet peeves, an issue he has raised at every forum and blames on the Council. “There is only one traffic officer covering Coast Highway; there used to be four,” Merritt said. “Near Ruby’s Diner, there is a school zone [St. Catherine of Siena]. The speed limit in school zones is 25 miles an hour. It isn’t posted and it isn’t enforced. His solution: hire more police officers. Merritt also condemns the Council’s relationship with the California Coastal Commission. One of Merritt’s top priorities if elected would be to stop what he considers an erosion of property rights. He blames the Council for not reining in the Design Review Board. “DRB has too many rules,” said Merritt. “I am for a lot of them, such as height limitations, but I would propose a ‘Greenlight Formula.’ [Greenlighting is generally understood to mean timely and less complicated approvals of projects.] “And if no decision is reached in two years, the project would be automatically approved. Another complaint is the cost of Cox Cable service: It is too expensive and doesn’t offer an a la carte option, the choice of which stations a customer wants and then pays only for those. “The City is like the surf, there are big days and little days, and they aren’t ready to get on their boards,” summed up Merritt.